CFS TaxTools is the flagship product of CFS Software, Inc. designed to help accounting professionals optimize their tax calculations for businesses — from organizing an indefinite amount of clients and preparators to importing data in print forms. Best of all, CFS TaxTools has a straightforward, intuitive design that aids users in swiftly preparing tax returns with ease, and a flexible pricing scheme that makes it suitable for users from all market tiers. Aside from efficiently collating all necessary data for tax preparation, the printed output is presented in an organized and professional manner, thus helping users clearly illustrate their client’s tax calculations and boost their confidence on their returns. Using it, you will always be in absolute control of the financial health of your business. CFS TaxTools allows accounting professionals to get access to a specialized program that features a breadth of worksheets, financial calculators, and worksheets for a low price, helping it stand apart from other solutions. CFS TaxTools also values presentation in submitting tax returns to clients as it outputs worksheets in a presentable manner alongside the users’ firm names. Client information is also intuitively mapped directly onto forms, and this can be submitted in a PDF format to mail them. Forms placed in the PDF file appear exactly as they do in the software to ensure a well-designed presentation. CFS TaxTools can also generate an invoice when billing clients, thus eliminating additional work for users so they can allocate their time and effort on other endeavors. Determining one’s filing status can be difficult, and CFS TaxTools eases this burden to help one determine the right filing status by answering a series of questions, and these are updated regularly whenever the tax laws change. For looking into the long-term, CFS TaxTools enables users to project tax calculations up to five years or five different scenarios including child tax, dependent care credits, and EIC. For safekeeping and for a paperless workplace, CFS conveniently helps users store and retrieve client information on any storage device. 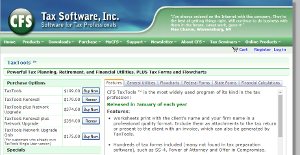 If you are interested in CFS TaxTools it may also be a good idea to investigate other subcategories of Best Tax Software listed in our database of SaaS software reviews. It is important to note that virtually no app in the Tax Software category is going to be an ideal solution able to meet all the needs of various company types, sizes and industries. It may be a good idea to read a few CFS TaxTools reviews first as some software might perform well just in a very small set of applications or be prepared with a very specific type of industry in mind. Others can function with an intention of being simple and intuitive and therefore lack complex features needed by more experienced users. There are also services that support a wide group of customers and give you a rich feature toolbox, however that frequently comes at a higher price of such a solution. Be certain that you're aware of your needs so that you buy a solution that provides all the functionalities you search for. How Much Does CFS TaxTools Cost? We realize that when you make a decision to buy Tax Software it’s important not only to see how experts evaluate it in their reviews, but also to find out if the real people and companies that buy it are actually satisfied with the product. That’s why we’ve created our behavior-based Customer Satisfaction Algorithm™ that gathers customer reviews, comments and CFS TaxTools reviews across a wide range of social media sites. The data is then presented in an easy to digest form showing how many people had positive and negative experience with CFS TaxTools. With that information at hand you should be equipped to make an informed buying decision that you won’t regret. What are CFS TaxTools pricing details? What integrations are available for CFS TaxTools?